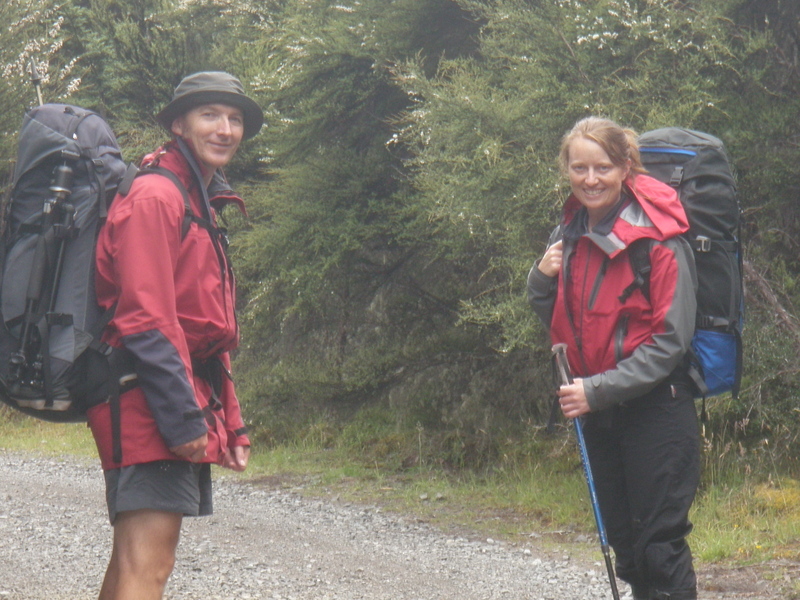 My good friends Jenny and Steve were avid trampers BC (before children) but didn’t attempt an overnighter as a family until Meg was five. 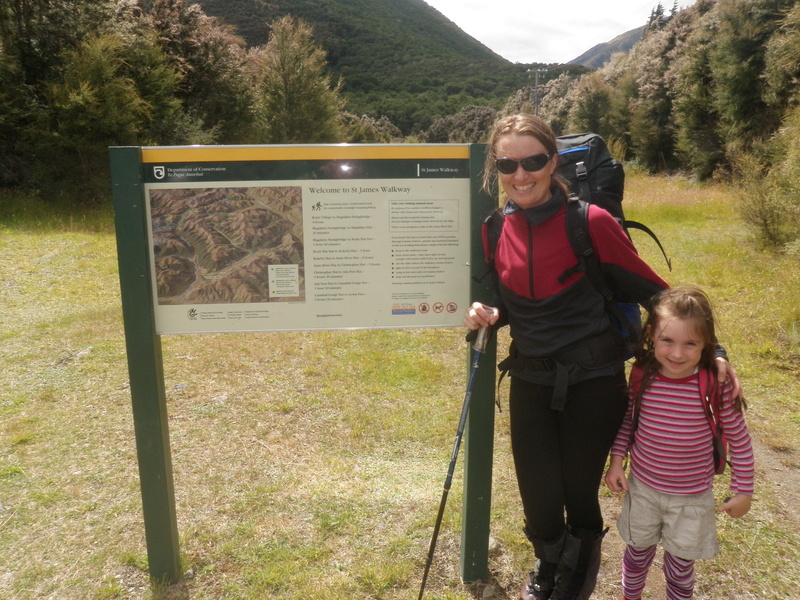 Their first trip – into Magdalen Hut, in St James Conservation Area – was absolutely fabulous said Jenny – and Meg had good things to say about it too! Mum Jenny and Meg at the start of their first overnight tramp! Meg had lots of day walks under her belt before our first tramp. 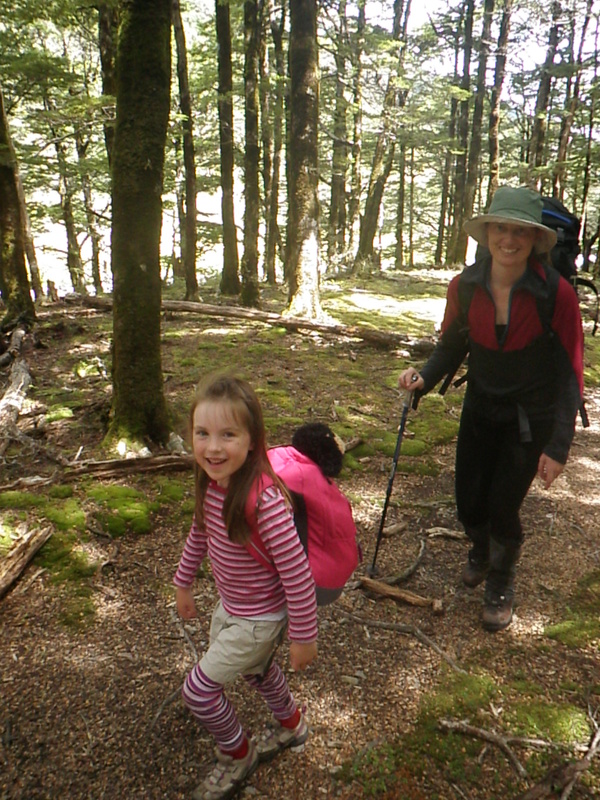 We’d been up to Packhorse Hut and back, with minimal carrying and complaining, so we knew she could walk for at least three and a half hours. So, despite threatening rain we set off – walking up the Boyle Valley, conjouling Meg along the way with pikelets. 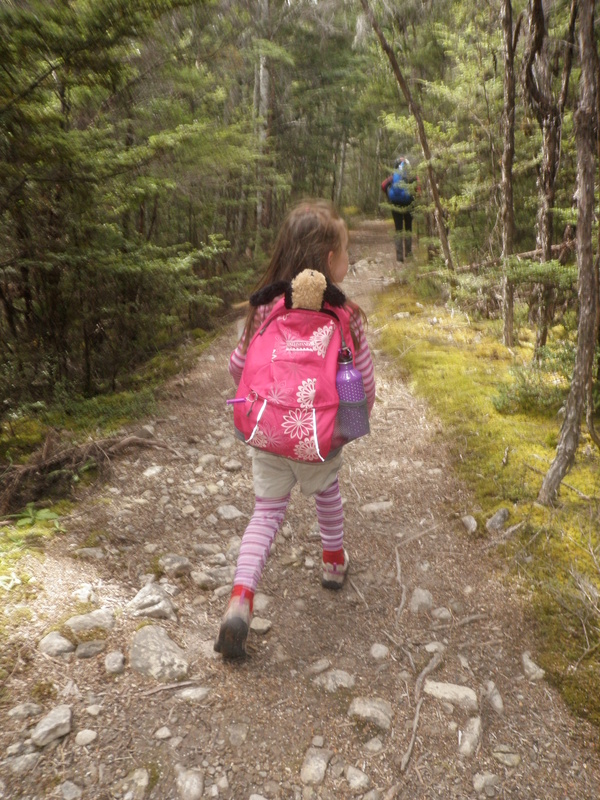 Meg carried her own pack, with her soft toy and a jacket. A couple of hours in, we took the pack off her, just to get her through that last stretch. 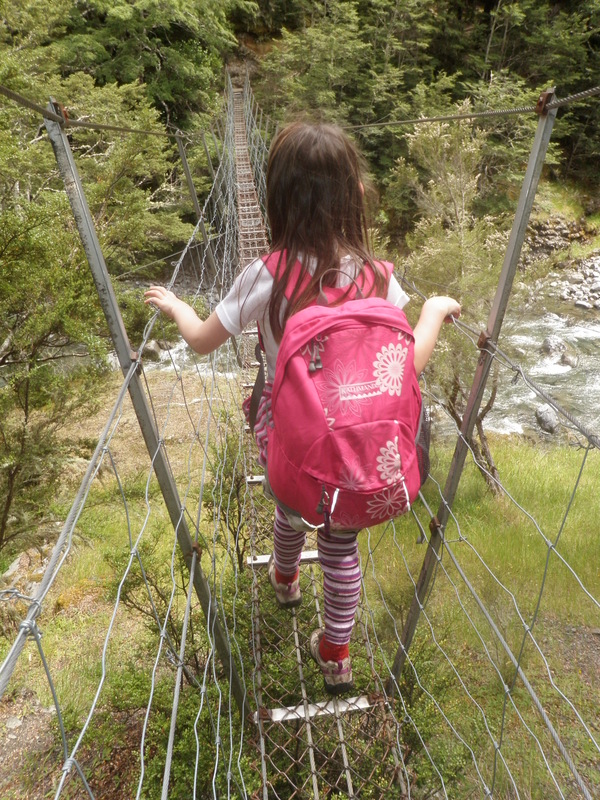 We thought the swing bridges might be a problem – we wondered if she would be scared, but she wasn’t at all. If we sensed impending ‘scaredness’ we talked about how exciting it was and how brave she was being. Meg bravely traverses her first swing bridge! There was also a washout before the hut, and we had to a climb a steep bank. Again, we didn’t give her a chance to be scared but kept her moving, with motivating words and promises of more pikelets. We didn’t take a tent, which was a bit risky. I would recommend one, just in case the hut is full, or so you can stop on the way if you need to cut the trip short. But the stars aligned over Magdalen Hut and we had it to ourselves. 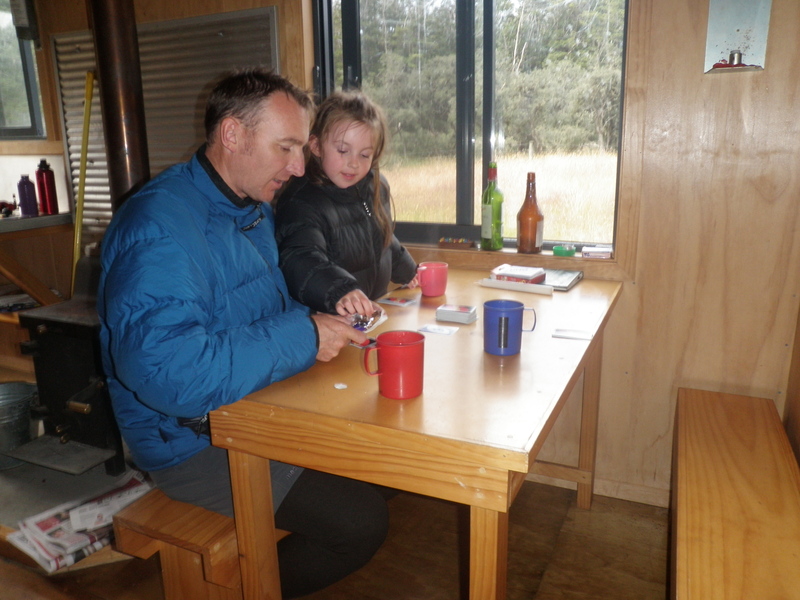 With its sunny little deck, six bunks, and double-glazed windows, it’s a really nice modern DOC hut, perfect for families. When we got to the hut Meg was pretty excited to find a little house in the forest. We ate chocolate and played Uno, which was a great game to bring along, very compact. Travel Scrabble would work well too. After tea we all went to bed at the same time. Meg patted my head as she went to sleep, as she was concerned because it was so dark. The platform bunks meant I could be nearby to reassure her. We got up in the morning and ate porridge for breakfast – with brown sugar as a treat! The trip out from the hut was easier, as Meg knew what to expect. We played ‘all around the world’ again … and again … it’s amazing how long that game can last. It was really good to do this trip as a family. We felt like we’d rediscovered our old life again and we were pleasantly surprised how much Meg could do. We could see a whole world of adventures opening up to us. Roll on summer! Mum and Dad by Meg Baker!